The .NET framework class library includes several common dialog boxes. These allow standard interactions with the user, such as font, file or colour selection or configuration for printing. This article describes the font selection dialog box. In this article we'll look at the font selection dialog box. The FontDialog class provides the common dialog box that permits a user to configure a font. The dialog box includes various options for changing the typeface used, the size and colour of text, and effects such as bold, italics, underline and strikeout. As a developer, you can use various properties of the class to limit the user's font options so that they are in line with the requirements of your project. To demonstrate the dialog box we need a sample project. Create a new Windows Forms project. Once the solution is initialised, open the designer for the automatically generated form. Add a button and a label to the form, using the properties described in the following table. SelectFontButton Button Text = "Select Font" Displays the font selection dialog box when clicked. Text = "This is some sample text." 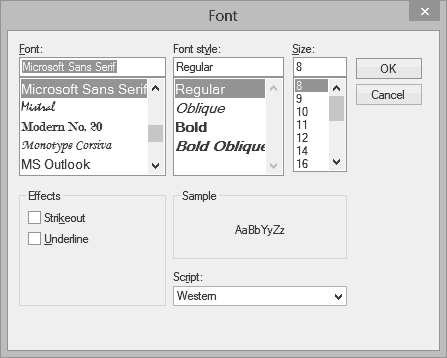 Shows a sample of the font selected using the font selection dialog box. You can display a basic font selection dialog box simply by creating an instance of the FontDialog type and calling its ShowDialog method. The dialog box is shown as a modal window, preventing the user from further interacting with the window that launched it until the dialog box is closed. This also means that control is not passed to the statement following ShowDialog whilst the dialog remains visible. The user can close the dialog box by clicking either the OK or Cancel button, or by closing the window using standard window controls. You can determine which button was clicked using the ShowDialog method's return value. This will be a value from the DialogResult enumeration. You should check that the value is DialogResult.OK before applying any of the user's selections, as they would not expect to see any changes if they click Cancel. The new typeface options are held in the Font property of the dialog box object. This returns a Font instance, which can be applied directly to many controls that display text. To demonstrate, double-click the button in the form designer to add an empty Click event. Modify the generated method as shown below. This code starts by creating a FontDialog instance and setting the Font property to the font from the label. This sets up the dialog box to match the label's current typeface options. The dialog box is then opened. If the user clicks the OK button within the dialog box, the new font options are stored in the label's font, updating the sample. Note that the operation is contained within the scope of a using statement. FontDialog implements IDisposable, so the statement ensures that the dialog box object is correctly disposed. Try changing the various font options. You should see that the new font is correctly applied to the label when you click OK. If you update the font options and click the Cancel button the label remains unchanged.